These are exciting times for faithful Catholics. The last time the Church got so much attention was when Pope Benedict was elected. I remember that time very well. I also remember how the enemies of the Church jumped at the opportunity presented to them by the fact that Benedict was German. The writing on the wall was obvious to them, if he was German and more than 60 years old then there must be a connection between him and the Nazi party. 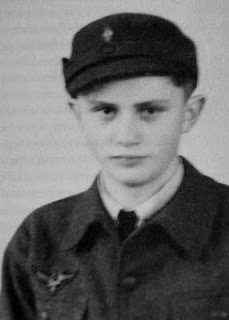 Before Cardinal Ratzinger was elected to lead the Catholic Church there were a number of biographies which spoke freely about the fact that young Ratzinger had been, at the tender age of 14, a member of the Hitler's Youth. Pope Benedict has long ago explained all this. It is a well known fact that he, along with many other German young men, was forced to joint this organization. It is also well know that young Raztinger found Nazism repugnant and refused to attend this organization meetings. This refusal was the cause why his family had to pay full tuition for his studies. All this is a matter of public record. Some of those biographies included the following picture of young Ratzinger. 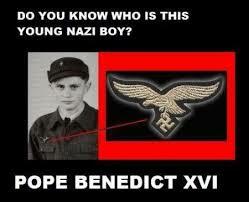 You can see that in this image he is wearing the Hitler Youth uniform. Of course facts such as Young Joseph's age (14), or that he was forced into joining the Hitler Youth, or the extreme dislike the Ratzinger family had for the Nazis (A fact corroborated by neighbors who knew them) are not important if the goal is to place the pope on a bad light. Pretty incriminating don't you think? The critics were ecstatic! 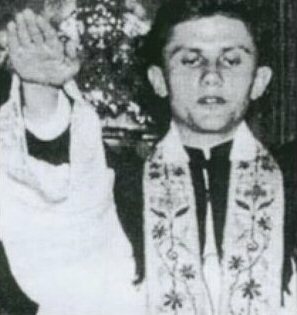 Finally a picture of Young Father Ratzinger giving the Nazi Salute!! This picture has been used to demonize the Pope and embarrass Catholics for the last eight years. In fact, even today you can find it in the most ardent anti-Catholic pages on the web. Of course critics not only enhanced this image, in their fervor to tie the Pope to Nazism, they went ahead and suspended all logic. 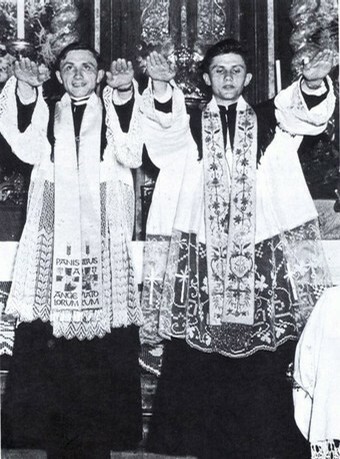 As you can see, this is a picture of young Pope Benedict and his brother the day of their ordination back in 1951 while they are imparting their priestly blessing to friends and family at the the end of their first mass. Quite revealing don't you think? Why am I telling you this? Well, the enemies of the Pope are at it again. As you know by now, the College of Cardinals elected Jorge Mario Cardinal Bergoglio, Archbishop of Buenos Aires, as the 266 successor of Peter. It took less of 24 hours after the Cardinals elected Pope Francis for someone to send me this "very incriminating picture". The man you see here receiving communion is none other than General Jose Rafael Videla, the man who deposed Isabel Peron on a brutal Coup d'état back in 1976. The priest giving communion to Gen Videla is (claimed to be) none other than Father Jorge Mario Bergoglio. The picture gives an impression of intimate familiarity between these two man. The humble communicant receiving the Eucharist from his priest. I received this picture with the claim, that "support (for) murderers is a bit much for a pope". ****UPDATE 1: One of the priests which were supposedly abandoned by then Provincial Father Bergoblio, has exonerated him from any wrong doing. As you can see, there are a number of people in this picture. 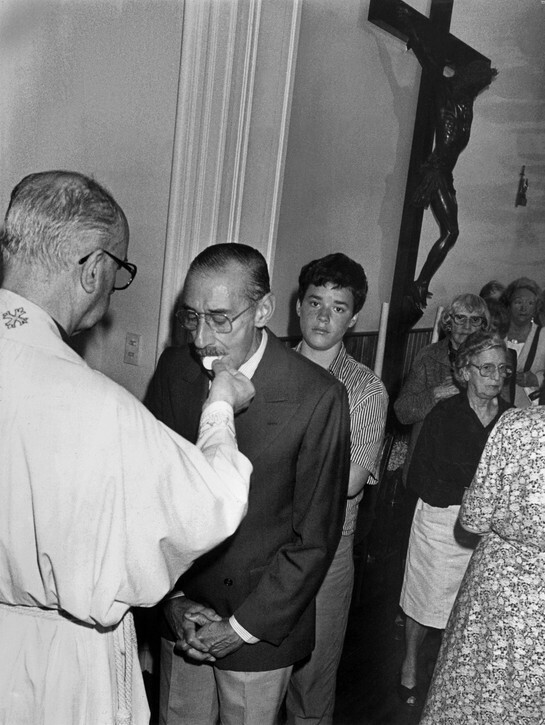 and if you are Catholic you will recognize what is going on here, we call it a communion line. In the original picture, it is not just General Virela receiving the Eucharist. You can even see other people in other lines waiting to receive communion from other priests. I guess Virela and Bergoglio do not look as cozy or intimate as before. In fact I do not see a bishop making a statement of support by giving a political figure communion in a private and intimate setting. I see a good priest giving communion to one of dozens of other people in a public mass. Is there any sign of recognition or familiarity by Bergoglio, I do not see it. How about you? 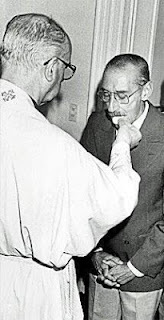 **** UPDATE 3: Since I started working on this article I have found other sources which shed more light about Pope Francis history during this turbulent period of Argentinian history as well as, explain reasons about this smear campaign. Article in which the Argentinian Supreme court exonerates Pope Francis from any wrong doing during that country's "Dirty War". Article explaining the animosity some groups in Argentina have against Pope Francis.